One of the members of the Armenian delegation, Tevan Poghosyan, informed NATO Secretary General Jens Stoltenberg about the incident and addressed a letter to James Appathurai, the Secretary General’s Special Representative for the Caucasus and Central Asia in hopes of receiving a response early in November. Poghosyan and his fellow delegate Koryun Nahapetyan believe the issue should be addressed, but without escalating tensions. “If NATO really values the inviolability of borders of its member states, it would be reasonable for the Alliance to serve an example and apologize for the incident, even if it has been caused by weather conditions. The incident is really an extraordinary and one, and I think NATO, of which Turkey is a member, should react to this case. Clear explanations are needed,” saidf Poghosyan. Armenia will host NATO Week from November 1 and the issue is expected to be addressed within that framework. During the NATO PA discussions on the Syrian crisis and the issue of refugees, Armenia came forth with concrete proposals. 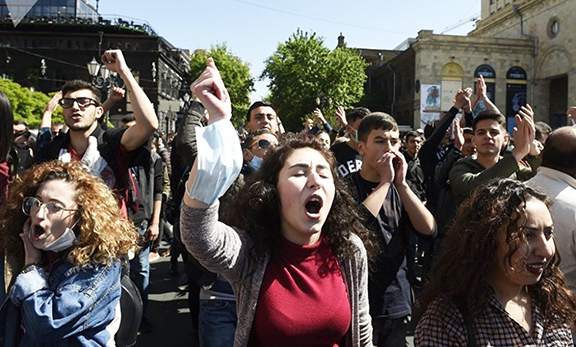 “Armenia has hosted more than 16,000 refugees,” Nahapetyan said. He added that it would be beneficial for NATO to provide assistance not only to member, but also partner countries. How come the west compensates Turkey on behalf of it’s refugees and dosn’t to Armenia with regards to the 16000 refugees? Because we in the west are a bunch of hypocrites. No warning to intercept/shoot down, if it reoccurs? Shoot these bastards down! Enough of nagging. Rajab oghloo dumping his miserable internal problems, like his counterpart Baku’s oil man Aliyev, over Armenians, in order to calm down brainwashed and restless Turkic herds! I am Armenian and I do not believe that ALL Turks are brainwashed, there is a growing number of intellectuals and ordinary folks who want Turkey to admit the Genocide their forebears committed and start a new chapter with the Armenians. As we blame the brainwashed we should also acknowledge the ‘conscientious’ Turks for their bravery hoping that their ranks grow.